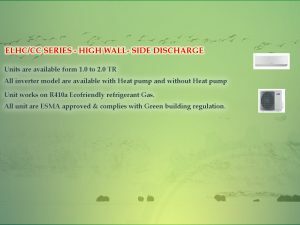 ELHC/CC SERIES - HIGH WALL- SIDE DISCHARGE Units are available form 1.0 to 2.0 TR All inverter model are available with Heat pump and without Heat pump Unit works on R410a Ecofriendly refrigerant Gas. All unit are ESMA approved & complies with Green building regulation. 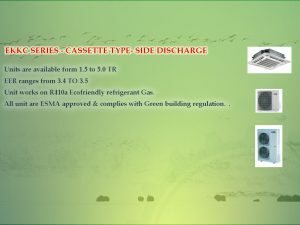 EKKC SERIES - CASSETTE TYPE- SIDE DISCHARGE Units are available form 1.5 to 5.0 TR EER ranges from 3.4 TO 3.5 Unit works on R410a Ecofriendly refrigerant Gas. All unit are ESMA approved & complies with Green building regulation. 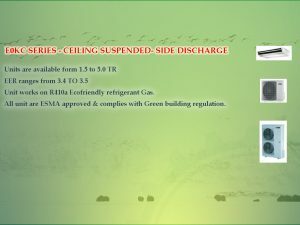 E0KC SERIES - CEILING SUSPENDED- SIDE DISCHARGE Units are available form 1.5 to 5.0 TR EER ranges from 3.4 TO 3.5 Unit works on R410a Ecofriendly refrigerant Gas. All unit are ESMA approved & complies with Green building regulation. 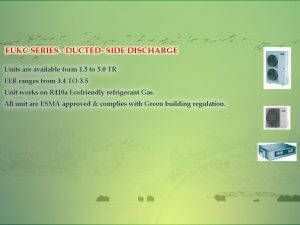 EUKC SERIES - DUCTED- SIDE DISCHARGE Units are available form 1.5 to 5.0 TR EER ranges from 3.4 TO 3.5 Unit works on R410a Ecofriendly refrigerant Gas. All unit are ESMA approved & complies with Green building regulation.